The Persian marriage ceremony is an old and beautiful tradition that many Persians would like to continue holding as they adapt to their life outside Iran. Even as Persians abroad marry outside their culture, they need not abandon the meaningful emblems of their heritage. 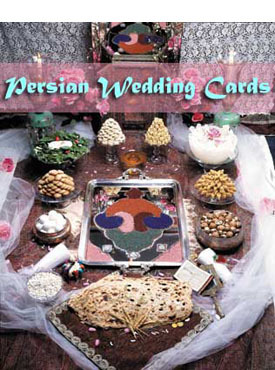 Adapted from material in the bestselling cookbook New Food of Life: Ancient Persian & Modern Iranian Cooking and Ceremonies, Mage’s wedding cards will help both family and guests understand the ritual and symbolism of the Persian wedding ceremony and invites them to participate in this rich ancient tradition. With a rich, full-color photo of the sofreh-ye aqd on the front, you can use the cards as wedding invitations, or give them to guests as they arrive for the ceremony, you can even send them as congratulations to friends who get married! The front of each card is a full-color photo of the sofreh-ye aqd (see picture above). Opening the card, on the left is an essay (see text excerpt below) explaining the origins and symbolism of the Persian wedding ceremony and the items on the sofreh-ye aqd. On the right is a blank area for your message bordered by a beautiful color border taken from an old miniature. Dressed in satin and silk with gold embroidery, the bride sits facing a mirror, ayeneh-ye bakht, or the mirror of fate. It is usually lit by two candelabra, one on either side, representing the bride and groom. According to tradition, the mirror and candlesticks, symbolizing purity and love, should be gifts from the groom. Just before sunset, when he enters the room in the bride’s home where the ceremony will be held, what he sees first should be the face of his wife-to-be, reflected in the mirror. • A tray of atel-o-batel (multi-colored herbs and spices to guard against witchcraft and to drive the evil spirits away). This tray consists of seven elements in seven colors: poppy seeds (to break spells and witchcraft), wild rice, angelica, salt and green leaves (to remove the evil eye), nigella seed, gunpowder and frankincense (kondor, to burn the evil spirits). • An assortment of sweets and pastries prepared in the bride’s home but paid for by the groom-among them are noghl, sugar-coated almonds; nabat, sugar crystals; baqlava, a sweet, flaky pastry; tut, mulberry-almond paste; nan-e berenji, rice cookies; nan-e nokhodchi, chick-pea cookies; nan-e badami, almond cookies; and sohan asali, honey almonds. • A large flat sangak bread with a blessing (mobarak-bad) written in calligraphy with saffron or cinnamon, nigella seeds or gold. • A platter of feta cheese, fresh herbs and bread to be shared with the guests immediately after the ceremony, to bring the new couple happiness and prosperity; a basket of eggs and a basket of almonds and walnuts in the shell to symbolize fertility; a bowl of honey to make the future sweet. • Two large loaves of sugar, kallehqand, to be used in the ceremony; fresh flowers, such as roses, tuberose, gardenia, jasmine and baby’s breath, in abundance, to express the hope that beauty will adorn the couple’s life together. • An open flask of rose water to perfume and purify the air. • A needle and seven strands of seven colored threads to sew up the mother-in-law’s mouth-only figuratively, of course. •A small brazier burning wild rue, the fumes of which are said to drive away evil spirits. •An open Koran or divan of Hafez. A holy man chosen by the couple reads the marriage contract and recites the traditional prayers. (During the reading of the marriage contract, all the unmarried women are asked to leave the room, the belief being that their chances for marriage might be jinxed.) The holy man then asks the bride, “Young and noble woman, do you realize you are marrying an honorable man for this mahr (security-money or property that the groom agrees to give the bride upon demand)?” But the bride is silent and those in attendance pretend the bride is absent, saying such things as, “She is not here. She went out to gather rosebuds.” Again he asks the question. This time the guests might answer, “The bride has gone to the library.” The holy man repeats the question three times and the bride finally answers with a shy, barely audible, “Yes.” He then declares the couple husband and wife. The groom kisses the bride, although the groom cannot join the bride until the arusi, the reception celebration. Traditionally, the arusi follows the aqd on the same night, or it may be held on a later day. The bride and groom moisten their little fingers with some honey and place it in each other’s mouths, then they each place a noghl, in the other’s mouth. Friends and relatives shower them with more noghls and coins or rice before offering them their wedding gifts. At this moment the mother of the bride takes off the bride’s right shoe and puts out the candles with it. The shoe symbolizes control of her fate, or bakht. To bring sweetness and energy for the wedding night, sometimes an egg omelet, Khagineh, is cooked and sprinkled with the same sugar that the bride and groom were showered with; this is then served to the bride and groom. The arusi is a lavish meal, sometimes with a whole roast lamb as the centerpiece. Jeweled rice, or sweet rice, is always served, along with many other dishes and an elaborate wedding cake. The celebration, with so much feasting, singing, and dancing, is a day for all to remember. After the guests have gone home, it is customary to give the remaining pastries to those who were unable to come and to those who helped make the day a success. The sugarloaf is kept by the bride. Before they enter their home, the bride kicks over a bowl of water placed in the doorway. The water spilled on the threshold represents enlightenment, happiness, and purification for her new house. A friendly competition starts with the bride and groom as the bride tries to enter her house while stepping on her husband’s feet. This act makes the bride the boss in the household. In recent years, the Persian communities abroad have changed and adopted the life-styles of their host countries. The Persian marriage ceremony, however, is so old and can be such a beautiful ceremony that it would be a shame not to enact it.